On Mother’s Day most moms receive a card, flowers, candy or even breakfast in bed–but here in Los Angeles not all moms are so lucky. There was a lot to celebrate in May 1945; the war in Europe ended with the surrender of Nazi Germany on May 7th. The mothers sons and daughters in the military would have the best Mother’s Day they’d had since before the war. Tributes to mothers were planned in churches and theaters all over Los Angeles. Dozens of Fox theaters offered free admission to mothers over 60. On one of the stages special guest celebrities included Bing Crosby, Abbott & Costello, Paulette Goddard, Rochester, and the Andrews Sisters. Teenager Barbara Adams had something special planned for her mother, Maude, but it didn’t have anything to do with flowers or a trip to the theater. On May 11, the Friday before Mother’s Day, Barbara went out shopping–she bought two canaries at a pet shop and a large knife at a downtown department store. Once she arrived home she tested the sharpness of the knife by decapitating the canaries in the kitchen sink, then she burned their bodies in an incinerator. She then prepared dinner for her mother who was expected to arrive late following her shift at General Hospital. An argument between mother an daughter broke out after dinner and ended when Maude smacked Barbara across the face. About 2 a.m. on Saturday morning Barbara, wielding the knife she’d bought the day before, crept into her mother’s room, placed a pillow over her head to stifle her screams and then stabbed her over 20 times. Barbara washed the murder weapon in the kitchen sink, then changed out of her bloodstained nightgown and went to bed on the living room sofa. Before going to sleep she pulled out the family Bible and read for a while. Barbara slept for over 12 hours. When she awakened on Mother’s Day, May 13, she dressed, cleaned up the apartment and then went to the first floor apartment of her landlady, Mrs. Anthony Dunn, and confessed to the murder. Dunn phoned the police. Officer C.O. Peterson was first at the scene. He said that Barbara told him that she had been contemplating the murder for a long time–she said, “We just couldn’t get along. I’d planned to take my own life but didn’t have the guts to do it. Now it’s up to you to take over.” Other than their disagreements, common enough between a 17-year-old girl and her mother, Barbara offered no motive for the slaying. Detective Thad Brown, of LAPD’s Homicide Detail, accompanied by Juvenile Officer L.M. Simmons, questioned Barbara. She told them about the knife, the canaries and gave them an account of the murder. She was taken to the hospital room at Juvenile Hall where she was admitted under an alias. She spent the day reading magazines. She had two roommates, but she didn’t say a word about why she was there. Barbara attended Sunday school and listened to Mother’s Day tributes. Afterwards, apparently unmoved, she watched her fellow inmates make tiny boutonnieres to present to their mothers during visiting hours. LAPD detectives and juvenile authorities questioned anyone who knew Barbara and Maude. Friends and neighbors described Barbara, a student at L.A.City College, as studious and quiet. According to some, Maude worked long hours to provide her with a decent education. Others described Barbara as morose because she wasn’t allowed to go out with school friends. Instead of hanging out with her buddies she was required to spend evenings at home with her mom, studying. It was up the the juvenile court to determined if Barbara was mentally competent to stand trial, and if she was they wold also need to decide if she would be handled as an adult or a juvenile. An interesting window on Barbara’s childhood opened when Albert and Lena Rogers, who lived in the 2000 block of Outpost Drive, turned up to speak on the young killer’s behalf. The Rogers went above and beyond. They arranged to have Barbara enrolled in Beverly Hills grade school with their daughter. The two girls later attended the Carthay Center Elementary School together. According to the Rogers’, Maude also pinched Barbara’s arm in the tender spot above the elbow anytime the girl made her mad. Finally, because Maude’s attitude and mental condition became so strange, the Rogers’ terminated her employment. They quietly slipped some cash into Barbara’s pocket and told her to remember she “always had friends” and to call them if she was ever in trouble. They didn’t see her again until her story appeared in the newspapers. Mr. and Mrs. Anthony Dunne were at odds with the Rogers’ characterization of Barbara as a victim. 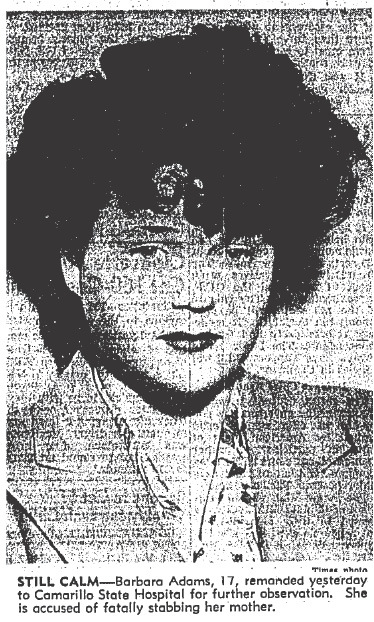 Testifying at the Coroner’s inquest, Mrs. Dunne called Barbara a “conceited little snob” with a suicide complex (Barbara had cut her wrists the month prior to the murder) that made her “cold as ice”. Mrs. Dunne also testified that Maude was a “devoted mother” who lived for her daughter’s welfare: “She even gave Barbara singing and dancing lessons, even though the girl couldn’t sing. They were always going to shows, the best shows in town.” What about the fighting described by Barbara? Mrs. Dunne denied ever hearing the two women argue. Barbara never explained her mother’s murder other than to say that she had her reasons or the stabbing. 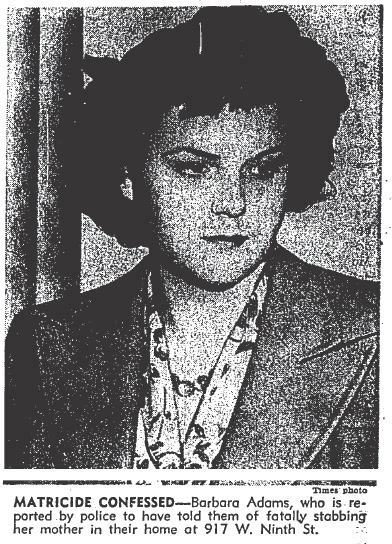 The outcome of Barbara’s case wasn’t reported in the Los Angeles Times; however, it seems likely that Superior Judge Georgia Bullock concurred with the psychiatric reports and sent Barbara to the state mental hospital. Barbara was never tried for her mother’s murder and she slipped quietly into obscurity. 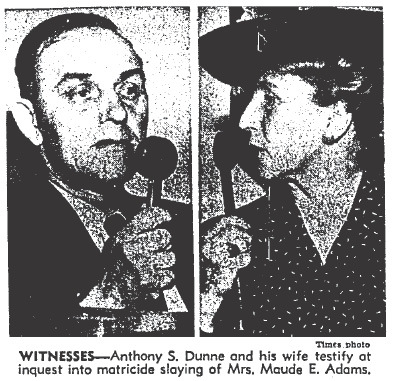 This entry was posted in 1940s, Homicide, L.A. Times, LAPD and tagged 1945, Albert rogers, Anthony Dunne, Barbara Adams, Betty Rogers, Camarillo State Hospital, Detective Thad Brown, Lena Rogers, Maude Adams by Deranged. Bookmark the permalink. I did a little sleuthing, and found a little additional info, inspired my your excellent post. Maude is buried here, near where she died: http://www.findagrave.com/cgi-bin/fg.cgi?page=gr&GSln=Adams&GSfn=Maude&GSiman=1&GSpartial=1&GSbyrel=all&GSdy=1945&GSdyrel=in&GSst=6&GScntry=4&GSob=n&GRid=85335406&df=all&amp; . Daughter Barbara wound up in New York, near where her mother and maternal grandparents were from (Maryland, Delaware). She was employed in a serving profession after release in California, and had apparently cultivated some friendships, during her years in Rochester. Surprisingly, her parents are acknowleged in her memorial bio, here: http://www.findagrave.com/cgi-bin/fg.cgi?page=gr&GRid=16203801&ref=acom . Finally, I was not terribly shocked to find the parents already split up, by the time Barbara was 2, in census records. Any way you look at it, Barbara was apparently her mother’s primary focus, for a long, long time.